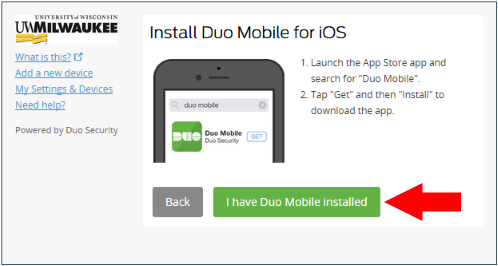 You can manage your device's Duo configuration using the Duo Device Management portal's self-service options. If you need assistance with Duo, please contact the UWM Help Desk at (414) 229-4040, toll free at (877) 381-3459, visit Bolton Hall 225, or submit a request online at gettechhelp.uwm.edu. 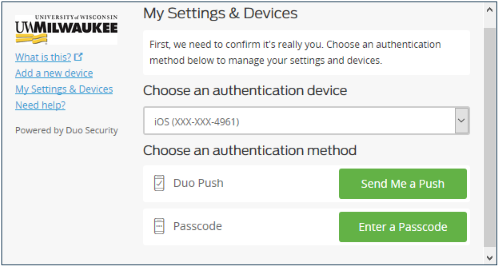 Choose an authentication method and complete two-factor authentication to manage your devices using the other sections in this article. To exit My Settings & Devices, click the Back to login or click the UWM logo on the left. 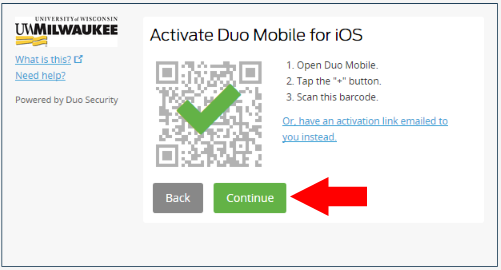 If you replaced your mobile device with a new one, you will need to reactivate Duo Mobile to get Duo Push working on your new device. 3. 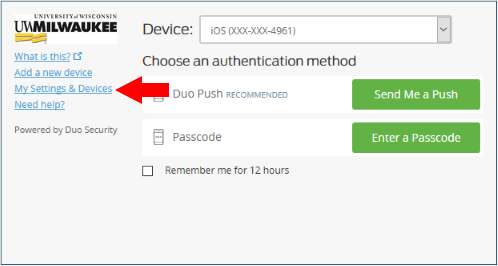 Generate a Bypass code, via the Duo Bypass Code page (additional information on Duo Bypass Codes can be found here). 2. In the Duo Prompt screen, click the My Settings & Devices link on the left-hand side. 3. Select your secondary method of multi-factor authentication to gain access to My Settings & Devices. You will need to choose a secondary authentication method, such as a Duo Hardware Token, U2F, or other iOS or Android and complete two-factor authentication in order to add a new device.